f you would like us to we can arrange transport for a small additional charge. 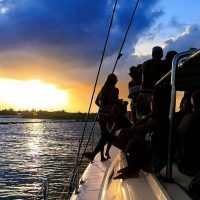 If you are staying locally or already have a transport company to assist during your stay we will be happy to provide directions to our shop in the Marina Puerto Aventuras where you will check in for your private sunset cruise. Our friendly English and Spanish speaking staff will meet you on arrival. They will check you in prior to boarding, direct you to the restrooms (although remember there are two on board) and answer any last minute questions you may have. Please plan to arrive at least 15 minutes before your departure time. For our sunset cruises we choose a departure time to ensure you enjoy the sunset depending on the time of year. Your exact sailing time will be confirmed on your booking confirmation to ensure that you enjoy the best possible sunset. Your bilingual guide will meet you and take you to the boat. Our crew are all extremely competent, experienced and just generally great guys! We are proud of the fact that most of them have worked for Fat Cat for 10 years or more. The crew will ensure that everyone gets on board safely and is seated for the safety briefing. Your safety is our first priority so we ask for your undivided attention to this briefing before you set sail. As you head out of the Marina Puerto Aventuras you will sail along the unspoiled coastline with its pristine uninhabited beaches. 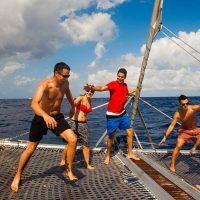 The crew will raise the sail and turn the engines off for you to enjoy the tranquility of the ocean as the sun begins to set on another day in paradise! 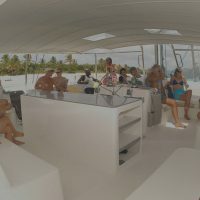 You will cruise the exclusive canals of Puerto Aventuras before anchoring to enjoy a beer or cocktail with family and friends to celebrate the sun setting on your perfect day. Your crew will head back to the marina where they will ensure that you head safely on your way back to your hotel or villa where no doubt you will continue to celebrate your memorable sail with Fat Cat.